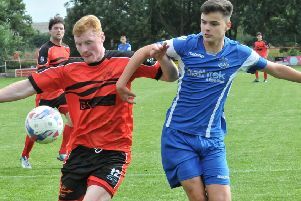 A third home game in seven days saw Garstang climb to ninth in the table with an 8-2 win against Shelley FC. The phrase ‘a game of two halves’ certainly applied to this rollercoaster game. The game exploded into life after just three minutes when debutant Brad Riley finished off a cross to give the visitors the lead. Almost straight from the restart, Garstang were back in the game when Jonny Hothersall smashed home a 25-yard effort. Any joy was shortlived when the visitors went straight down the other end where Adam Daffern scored to restore the visitors’ lead. Garstang, defensively, went through a rocky spell in the first half and Shelley could easily have scored three or four more. However, a combination of poor finishing and good goalkeeping conspired to keep the score at 2-1. At the other end, Ric Coar and Jake Salisbury had excellent opportunities to bring the scores level but these chances went unconverted as Garstang trailed 2-1 at half-time. The second half started and Garstang were unrecognisable from the team that played the first half. Hesitancy, sloppy passing and poor positional play was replaced by dynamic running, crisp passing and good interplay. As was the case with the Chadderton game, the manager’s words at half-time seemed to kick the team into life and normal service was resumed. Dan Birch burst down the left, cut into the box and was taken out to give the referee an easy decision to make. To no complaints from the away side, a penalty was awarded which Tom Entwisle converted to make it 2-2. The heavens opened and, as well as raining water, it started to rain goals. 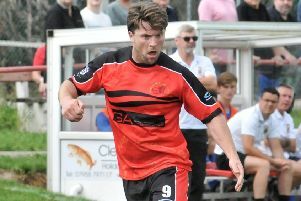 Salisbury helped himself to two goals, while Jack Bennett then scored the best goal. Great team play found Ben Roberts on the right, who then proceeded to hit a precision pass for Bennett who, without breaking stride, calmly sidefooted the ball into the net from just outside the box. Shelley were shellshocked and made all of their allotted changes but to no avail as wave after wave of attacks caused havoc in the visitors’ 18- yard box. Garstang were then awarded another penalty which McKenna slotted home, and with the clock ticking down, Hothersall bagged a second with a great finish before Salisbury capped a great performance with the eighth.